This was Puig’s first three-dinger game in his six seasons in the majors, but that’s not the cool part. No, the cool part is, it came less than 24 hours after Puig’s sixth career two-dinger game. 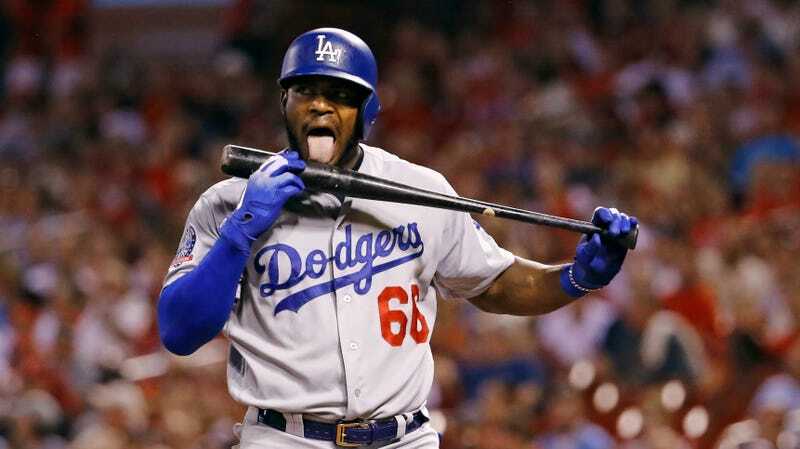 Puig launched a pair of home runs Friday night, as part of a 3-for-4 night at the plate in a 3–0 Dodgers win. So Puig is now 6-of-10 with five dingers and nine RBI in his last two games, and an even more impressive 9-of-14 in his last three starts. The timing is terrific—the two wins over the Cardinals, by a combined score of 20–4, have put the Dodgers a game up on St. Louis for the second NL Wild Card spot, and into a virtual tie with the Rockies atop the NL West. The series wraps up tomorrow, in front of a horrified and deeply offended Cardinals home crowd.